I'm a sucker for a good deal and since St. Patrick's Day usually brings fantastic deals on cabbage, I'm stocked up. I also bought some wonderful kielbasa to pair with the cabbage so I could make a European Cabbage and Sausage dish. Then I started to crave a curry. So I looked at these two ingredients and decided it's time they met my curry spice cabinet. I didn't really have a plan, but I pulled out my favorite curry tricks and I was so happy. We ate this spicy curry that doubles as a meat dish and a side dish in one with some mild lentils and rice. Heat oil in a large pan on high heat. Add sliced kielbasa sausage and brown well then remove out of pan. 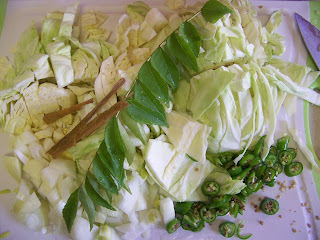 Add curry leaves to remaining hot oil. 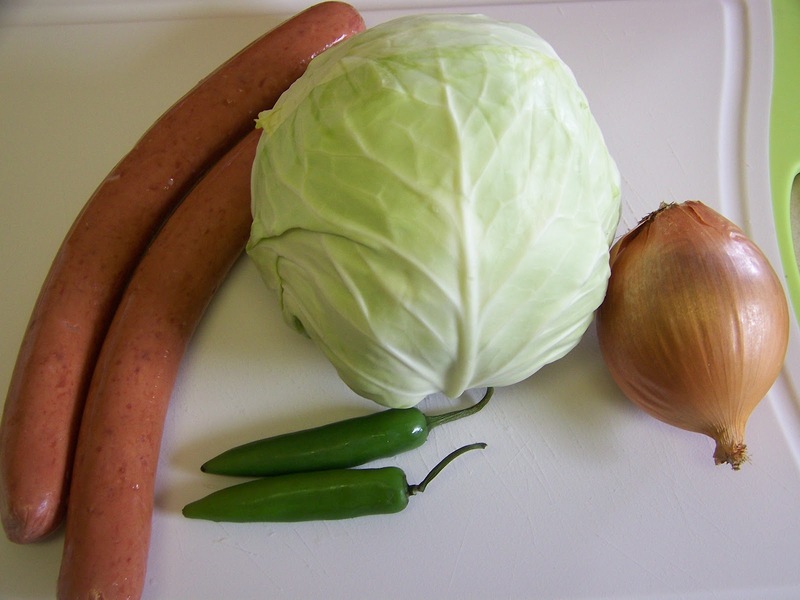 Then add cabbage, onion, green chili and cinnamon stick. Stir fry well for a few minutes. Then add salt to taste, cumin seeds, chili flakes, ginger and garlic. Stir fry for another 2-3 minutes. Next add the turmeric, curry powder and chili powder (if you want it spicy) to the pan. Stir fry for another few minutes. 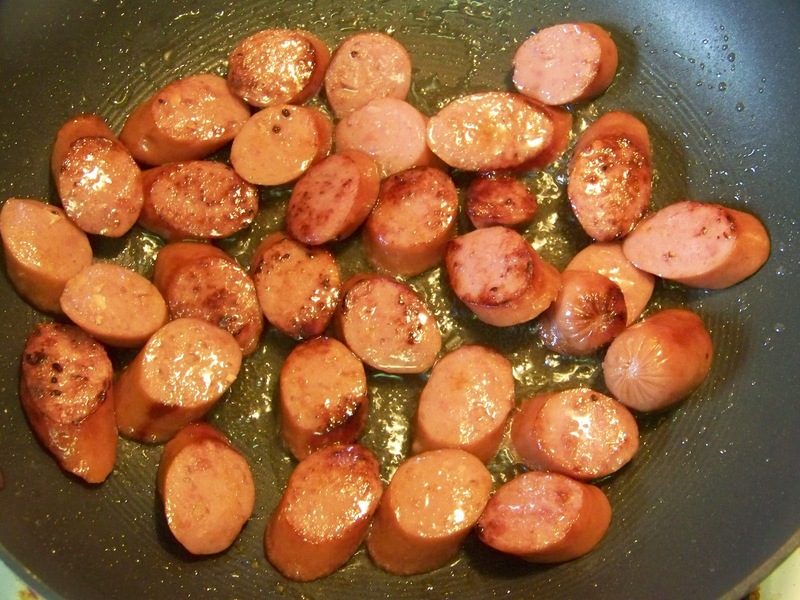 Add the cooked kielbasa back into the pan and one cup of coconut milk. If you need more liquid add 1/2 cup of water. 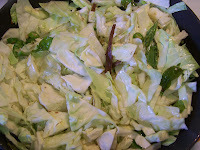 Allow the ingredients to come to a boil and finish cooking the cabbage. Taste and re-season with salt if necessary. The dish is done. Enjoy. 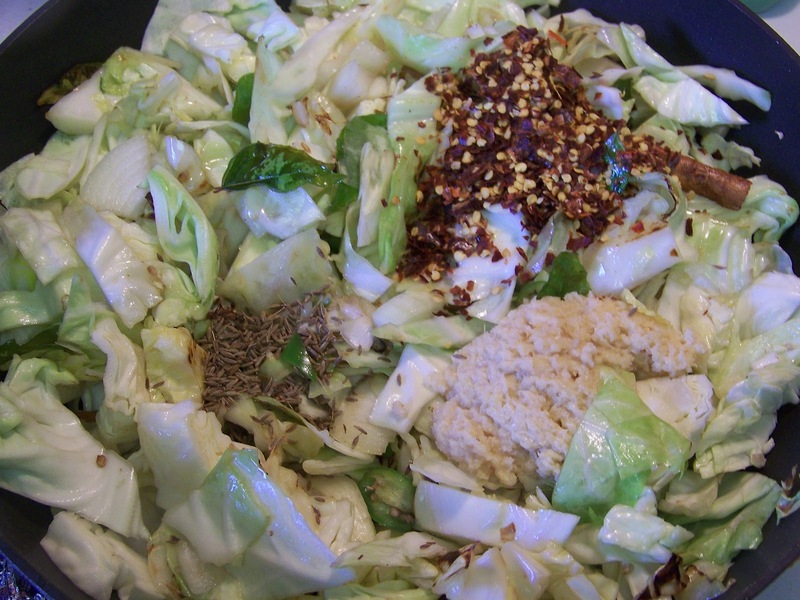 very flavorful recipe,a lots of great ingredients on this dish !! 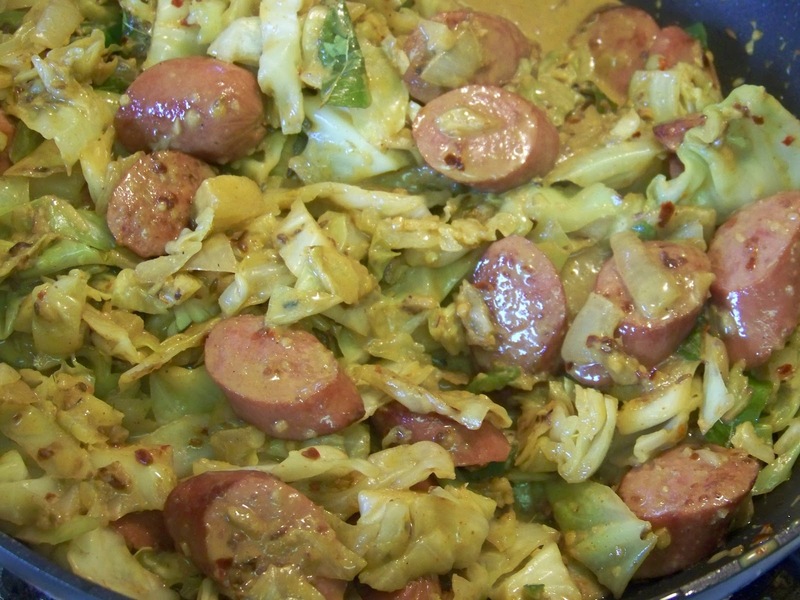 I bought cabbage today so all I need is the kielbasa and I'll have a dish that looks this good! yum! my mom used to make this for me all the time minus the curry twist which sounds amazing! I am def going to have to tell her about this...thanks for sharing!!! 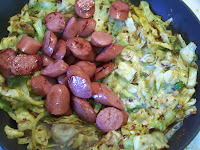 I love kielbasa and cabbage....you've taken it to another level though and I'm loving it. This looks fantastic. I love it when you start pulling things out of your cabinets! 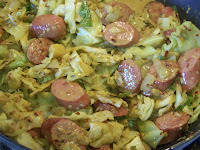 The flavor is a little different but my mom stir fries cabbage and sausage together and I really love that. I've never tried kielbasa before but I can imagine this is very delicious. The amount of green chilies will make me drink a gallon of water. Hee hee. But I can eat "mild" version! Ooh, this looks delicious--love the addition of curry to liven up the dish! Yum,this look so, so good! Wow, this must be the most uncommon curry I've seen in a while! Somehow I can just imagine it working beautifully, though :) Lovely idea, Ramona! I love the things you do with curry! 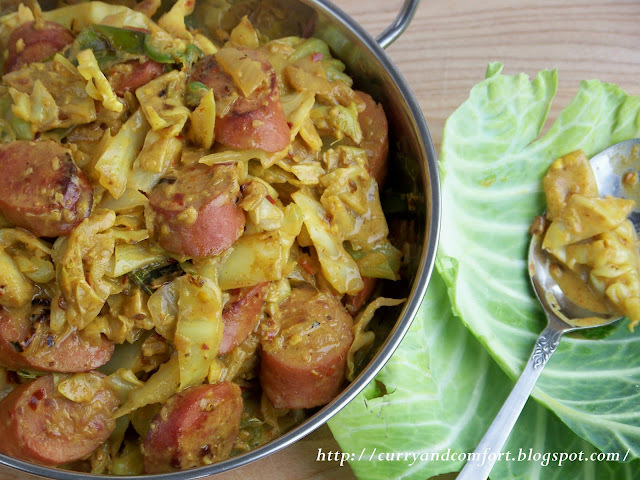 Cabbage and kielbasa curry?! So creative and it looks so good! Great way to spice up the boring cabbage. Lovely recipe Ramona. I've had cabbage and kielbasa together before, but never in a curry. I'm going to have to borrow some of your recipes soon. 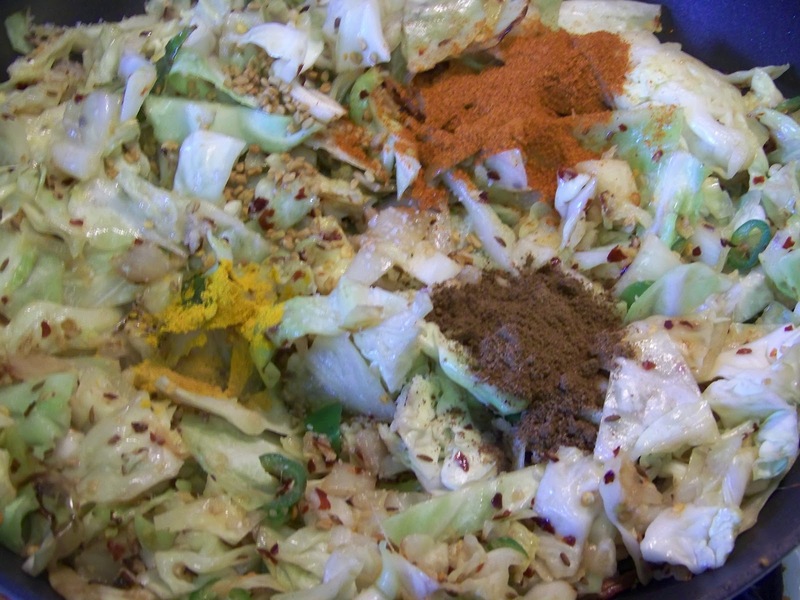 My daughter-in-law's mother is visiting soon and I want to make a curry for her. Yum!!! 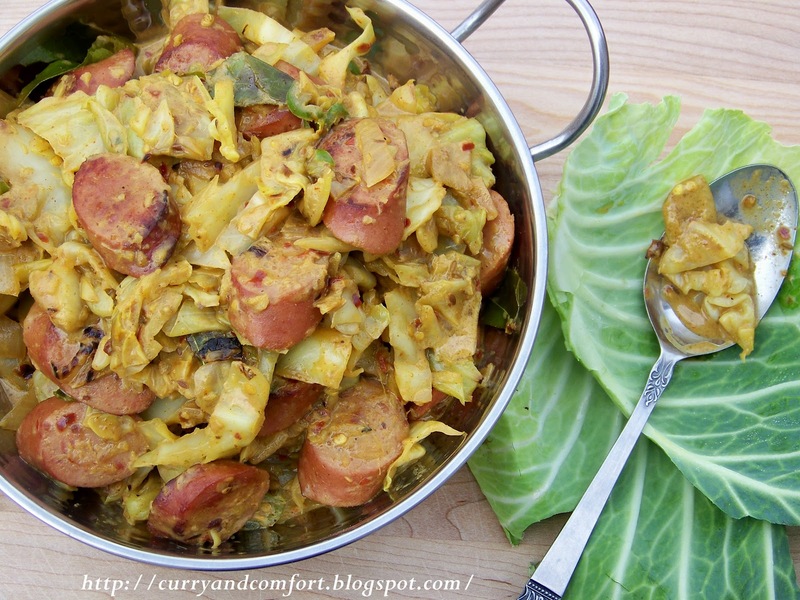 Ramona, I love cabbage, especially with Curry and of course the kielbasa. Beautiful pictures.